Portland is scenic. Portland is a foodie’s paradise. Portland is green. Portland smells like roses. Portland smells of cigarette smoke. Portland is bicycle friendly. Portland is home to the homeless. Portland is weird. Portland is a city in the state of Oregon, situated at the confluence of the Willamette and Columbia rivers. It has a population of over 500,000 but with over 2 million in the metropolitan area. Our trip began with a check-in at Hotel Modera, a downtown hotel, that is perfect for exploring the city on foot. Day 1: Gardens: After our 4 hour Southwest flight from Chicago and making a temporary home out of our hotel room, we decided to get some lunch. First food stop – Mama Mia Trattoria for excellent Italian fare. A walk across town led us to the Portland Saturday Market in Ankeny Square. A collection of art, craft, food and wine with street performers adding a little flair all made for a perfect, lazy, Saturday, afternoon stroll. With plenty of sun hours left we decided to drive to Washington Park, one of the largest urban parks, we’d ever seen. It includes a zoo, forestry museum, arboretum, children’s museum, rose garden, Japanese garden, amphitheater, memorials, archery range, tennis courts, soccer field, picnic areas, playgrounds, public art, and many acres of wild forest with miles of trails. We started with the Japanese Garden. True to its nature, a walk through the garden brings a sense of peace, tranquility and a quietness within you, and the exact calmness you want on a short stress-relieving vacation. The garden has been consistently voted as one of highest quality in the US. Our next stop was the adjoining International Rose Test Garden. There are over 7,000 rose plants of approximately 550 varieties. The roses bloom from April through October with the peak coming in June and thus lending the moniker City of Roses to Portland. Day 2: Parks and Mansions: Breakfast is the most important meal of the day and what is more important than driving miles to find a window in a small building, where fresh waffles magically appear from? Nothing. The Waffle Window is a Portland tradition. Over 3000 restaurants in Portland and this gets top billing every time. There is a wait but oh, so worth it. We drove back to the city to the Tom McCall Waterfront Park, Portland’s version of a river walk. The river bank is lined with shops and restaurants and the park is wide and open with plenty of geese to keep any 2 year old company. Lunch was at the Blossoming Lotus, a vegetarian restaurant, and a yummy one at that. We then drove to Pittock Mansion. The Pittock Mansion is a French Renaissance-style “château” in the West Hills of Portland, Oregon, USA, originally built as a private home for The Oregonian publisher Henry Pittock and his wife, Georgiana. It is a 22-room estate built of Tenino Sandstone situated on 46 acres that is now owned by the city’s Bureau of Parks and Recreation and open for touring. 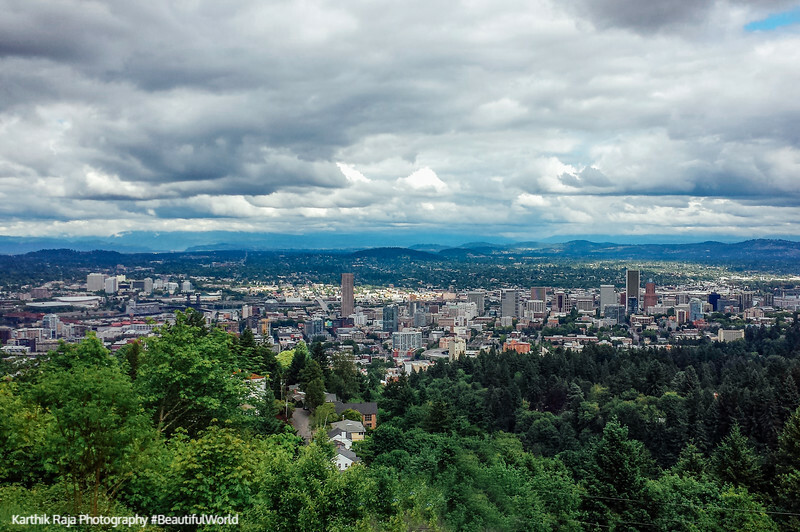 In addition, the grounds provide panoramic views of Downtown Portland. We ended the day with dinner at the Farm Cafe. Eggplant burgers, potato risotto and raspberries and ice cream. Day 3: Outside Portland: Breakfast at Bijou Cafe, beet salad and omlettes, with Stumptown coffee that makes the 4.5 rating, totally deserved. We then drove out of Portland, following I-84 east till we were by the Columbia River. Take exit 22 and branch off to the Historic Columbia River Highway. We spent the day at the Columbia River Gorge National Scenic area (Click to see all photos). The Columbia River Gorge is a canyon of the Columbia River in the Pacific Northwest of the United States. 1,200 m deep and over 80 miles long, the river winds westward through the Cascade Range forming the boundary between the State of Washington to the north and Oregon to the south. The best way to access the area is from Portland, Oregon, a mere 30 minutes away. Take I-84 E from Portland and exit 22 onto the Historic Columbia River Highway, an approximately 75-mile scenic highway between Troutdale and The Dalles, built through the Columbia River Gorge between 1913 and 1922. As the first planned scenic roadway in the United States, it has been recognized in numerous ways, including a listing on the National Register of Historic Places as a National Historic Landmark, designation as a National Historic Civil Engineering Landmark by the American Society of Civil Engineers, and considered a “destination unto itself” as an All-American Road by the U.S. Secretary of Transportation. It truly is a destination by itself. The first stop on the highway is the Vista House, an observatory at Crown Point 733 feet above the Columbia River. Visit the gallery in the basement and if weather permits, climb to the top of the dome. After a quick break, continue on till you are stopped in awe by the Latourell Falls, clearly visible from the road. Situated within the Guy W. Talbot State Park, the falls drops straight down from an overhanging basalt cliff. Try to do hike as much of 2.1 mile trail as weather will permit and then continue back on the highway. A few miles east, is the Bridal Veil Falls. Unlike most of the falls on the highway, this one requires a hike of 3/4 mile before you can catch a glimpse, but when you do, the hike easily becomes worth it. Next, is the Wahkeena Falls, a beautiful cascading falls. A short hike will lead you to a bridge that overlooks the largest drop section of the falls. A longer hike east of the Wahkeena falls will lead you to the Multnomah Falls. Multnomah Falls is a waterfall on the Oregon side of the Columbia River Gorge, that drops in two major steps, split into an upper falls of 542 feet and a lower falls of 69 feet for a total credited height of 620 feet. It is also the 2nd tallest year-round waterfalls in the US and is visible from the scenic highway but definitely do the hike to the bridge or even to the top. A day long trip with plenty of hikes and waterfalls, all through continuous rain, gave us appetite only Andina could satiate. Ranked number 1 in all of Portland, this Peruvian restaurant is a must do. The sauces, the cheesy, quinoa rice are all excellent. Reservations are highly recommended. Day 4: 3 days of sightseeing in a day: We started the day with a visit to the Lan Su Chinese Garden, a walled Chinese garden enclosing a full city block, in the Chinatown area of Portland. A perfect compliment to the hilltop, sprawling Japanese Garden, the Chinese garden creates a most tranquil space, well within the urban cacophony of Portland. Next stop, Powell’s city of Books. Powell’s claims to be the largest independent new and used bookstore in the world. It contains over 68,000 square feet of retail space and they buy around 3,000 used books a day. If you are like us and get lost in a book store, then you will need a compass, a map and a pair of very strong hands to pry you out of this city. Awesome! We proceeded to Voodoo Doughnut, another must do Portland tradition. Having given the effort mid-way the day before, we managed to find a shorter wait for the doughnuts and promptly bought 2 each. Fancy a doughnut, in a weird shape, color and name. This is it. Next, lunch from the food carts. Another must do. We ate arepas and patacones from the Colombian food cart on 2nd ave. Then, a drive back to Washington Park to the World Forestry Center, a nonprofit educational institution with plenty of exhibits to keep kids and adults entertained for an hour. We learnt that we can never be loggers even if we had the most sophisticated, video-game like console to control the equipment with. Next, a race to see Portland from the sky. The Portland Aerial Tram or OHSU Tram is an aerial tramway in Portland, Oregon, carrying commuters between the city’s South Waterfront district and the main Oregon Health & Science University (OHSU) campus, located in the Marquam Hill neighborhood. The tram travels a horizontal distance of 3,300 feet and a vertical distance of 500 feet in a ride that lasts three minutes. We thought we were done for the day, but again, thanks to late setting sun, and the proximity to the Columbia River Gorge, we drove back to the scenic area, to see the falls we had missed and see them all again, on a clearer day. It was worth it. The Multnomah Falls, is way easier to enjoy when not being drenched. The day finally came to a close but not before grabbing ice cream from Salt and Straw, another Portland joint, that requires a 30 minute wait at 8 pm to get a taste but a taste that leaves you wanting more. We reversed our dinner order and grabbed food to go from the Bollywood Theatre next door. Sometimes, comfort food is the best. Bhel puri to end the day. Day 5: One lane, but so much to do: Our last day, or half a day, and we started with a quick stop at the Ira Keller fountains opposite our hotel. Then a walk to the South Park Blocks. Twelve blocks in length, The New York Times stated the blocks are “literally at the heart of the city’s cultural life.” Every block contains public art, such as the 1926 Joseph Shemanski Fountain, “Rebecca at the Well”, designed by Carl L. Linde, a $40,000, 18 feet bronze statue of Theodore Roosevelt on a horse, designed by Alexander Phimister Proctor, and one of Abraham Lincoln, “facing north, slump-shouldered and pensive”, added in 1928, commissioned by Coe in 1926, sculpted by George Fife Waters. The park also contains approximately 337 elm, oak, and maple trees valued at $3.4 million, as well as roses. The park also served as the location for the Portland Farmer’s Market, which to our surprise is on Wednesdays. Perfect, for our breakfast was taken care of. Tamales, from Salvador Molly’s food cart. The best we’ve ever tasted. Just enough energy to walk by the Art Museum, the churches and then back to our hotel for the check-out. Our flight was in the afternoon, ensuring we got home to Chicago, 2 hours ahead in time, without a red-eye. Portland is a great city for a weekend trip, though spending 4 to 5 days is highly recommended. It is a great mix of everything and hard to categorize. I guess it is best to use their own words and say Keep Portland Weird.